The Anaheim Ducks have had a productive and effective offseason since being eliminated by the Chicago Blackhawks in game 7 of the Western Conference Final. 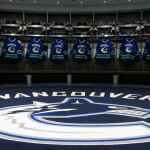 Acquiring winger Carl Hagelin from the New York Rangers, adding veteran defenseman Kevin Bieksa from the Vancouver Canucks, re-signing promising star Jakob Silfverberg and bringing in hard-nosed winger Chris Stewart on a reasonable 1-year deal are all moves that represent progress for Anaheim. 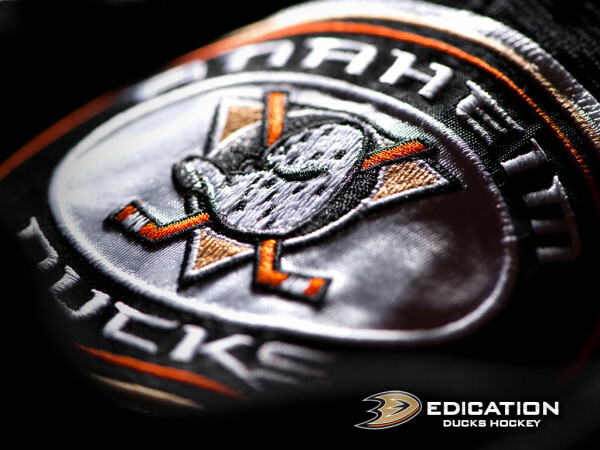 Though the Ducks have been one of the top teams in the NHL for the past several seasons, Anaheim has faced disappointing playoff defeats, including a game 7 loss in the first round to Detroit three seasons ago and back-to-back game 7 losses after blown 3-2 series leads (one against Los Angeles in the second round two years ago and the other against Chicago in the Conference Final this past season). 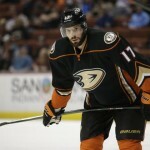 Adding Ryan Kesler last summer was an important move for the Ducks to solidify the team’s strength up the middle. Anaheim’s young defense has another year of NHL experience, and with the help of a few key offseason moves by management, the Ducks are poised to make another solid run at the Stanley Cup, especially given Los Angeles’ off-ice issues and Chicago’s salary cap constraints, which have forced several trades. Though LA and Chicago have been able to make creative moves despite such adversity, the Ducks have taken bigger strides and have thus more significantly improved the odds of the Stanley Cup returning to Anaheim. New York Rangers left winger Carl Hagelin celebrates after scoring the series-clinching goal in OT of Game 5 in the Eastern Conference Quarterfinal matchup against the Pittsburgh Penguins. 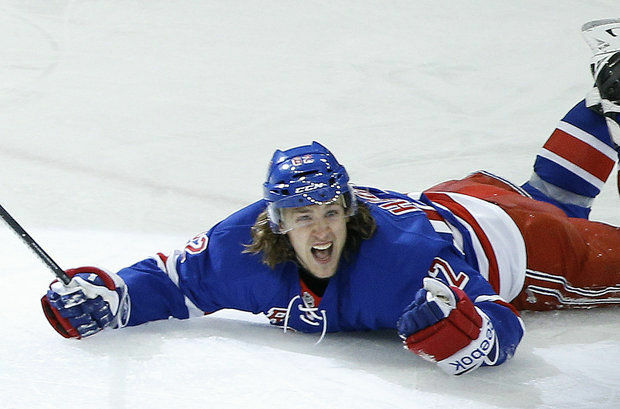 Carl Hagelin was underrated and underutilized in New York. He is easily one of the fastest players in the NHL, has a solid, consistent work ethic, is phenomenal on the penalty kill and has great hands and a deceptive shot. With his speed and ability to score on the breakaway, as well as his strong two-play way and offensive abilities, Hagelin will fit nicely on either of the top two lines in Anaheim. Whether he plays with the dynamic duo of Ryan Getzlaf and Corey Perry or lines up next to Ryan Kesler and Jakob Silfverberg, Hagelin should make a noticeable impression on the Ducks’ roster immediately. Though his game and Silfverberg’s game share certain similarities, it seems evident that the two Swedes would complement each other nicely, especially with a player like Kesler in the middle. The trio of Hagelin-Kesler-Silfverberg would not only be an offensive threat but could also be one of the strongest defensive lines in hockey. Putting Hagelin on the top line with Getzlaf and Perry, on the other hand, would only amplify the already-impressive results Getzlaf and Perry produce on a nightly basis. Hagelin’s boardplay, speed and effort will give Getzlaf and Perry even more time to set up in front of the net or get open in the slot, and Hagelin is capable of putting up 20 goals, which is something the top line has lacked since trading Bobby Ryan to Ottawa. Perhaps most importantly, Hagelin always elevates his game in the playoffs. 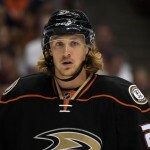 No matter what, Hagelin will be an effective addition to the Anaheim Ducks’ roster. Kevin Bieksa is not the same player he was a few years ago but is still a rugged defenseman with plenty of veteran playoff experience who plays a tough game. Though Anaheim’s young defensemen have already accomplished a lot, Bieksa will be a strong mentor and will further solidify the group. Bieksa has had injury troubles and struggled in the 2014-2015 regular season, but look for him to rebound with a fresh start in Anaheim playing with some of the most talented young defensemen in the league. 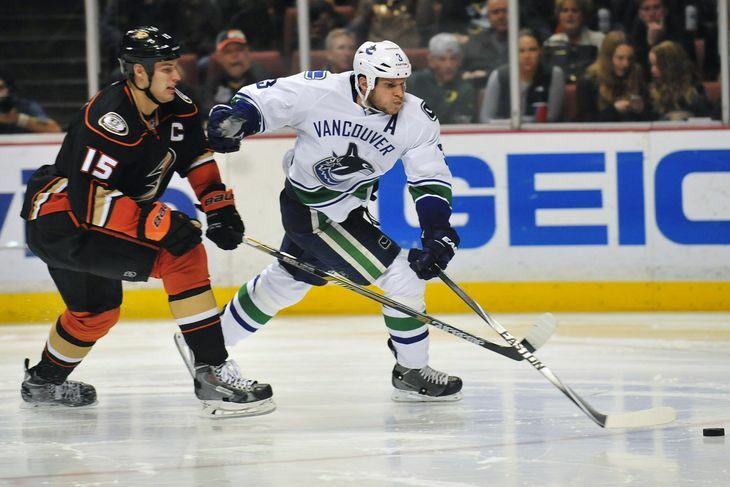 Bieksa is also an important replacement for veteran defenseman Francois Beauchemin, who signed with Colorado. Bieksa is a right-handed defenseman, which will give the Ducks added flexibility; in all likelihood, he will pair with Hampus Lindholm as a top 4 defenseman. 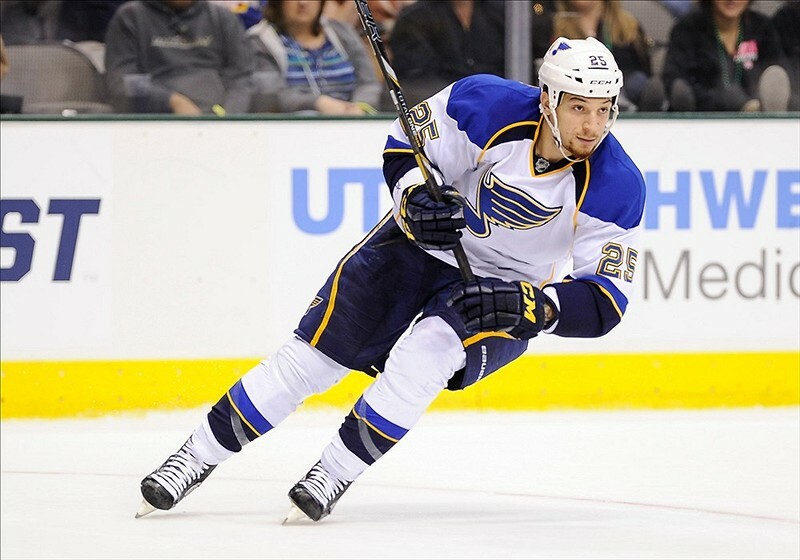 Chris Stewart was the subject of nonstop trade speculation last season and was eventually dealt by Buffalo at the trade deadline to the Minnesota Wild. Though he had some success with Minnesota (11 points in 20 regular season games, 2 assists in 8 playoff games), Stewart entered free agency and eventually agreed to a deal with the Anaheim Ducks. Minnesota had some interest in re-signing him but had other free agent priorities, such as goalie Devan Dubnyk and forward Mikael Granlund. Stewart is a talented winger and plays a tough game but has struggled with inconsistency throughout his career, something he fully admits. Signing him to a reasonable 1-year deal for $1.7 million gives the Ducks another solid winger who could put up decent numbers, and it also gives Stewart a blank slate, which could help him return to his old form, such as when he exploded with 18 goals and 18 assists for 36 points in 48 games for St. Louis in the lockout-shortened season in 2013. Stewart will most likely be a middle-6 winger and could see time on the 2nd line depending on team chemistry and injuries. He has the talent and the potential to be a strong player for the Ducks this season; a fresh start with a new winning culture just might do the trick. Ottawa Senators head coach Paul MacLean congratulates Jakob Silfverberg on his first NHL goal. 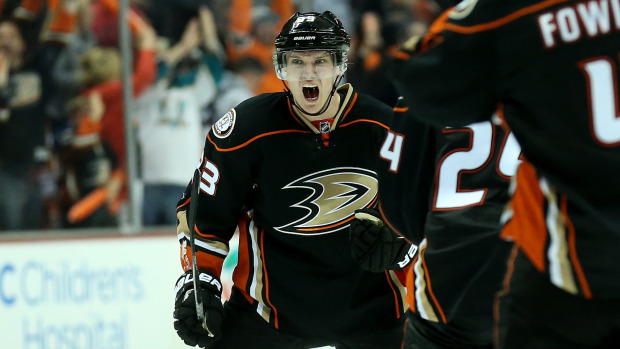 Jakob Silfverberg #33 of the Anaheim Ducks celebrates after scoring the game winning goal with 19 seconds left in the third period against the Winnipeg Jets in Game Two of the Western Conference Quarterfinals during the 2015 NHL Stanley Cup Playoffs at Honda Center on April 18, 2015 in Anaheim, California. The Ducks won 2-1. [/caption]Jakob Silfverberg continues to improve as a talented and intelligent hockey player in the NHL. Silfverberg, who was drafted in the second round by Ottawa in 2009, posted career highs in goals, assists, points, plus/minus and shots on goal last season, and had a very impressive playoff run by scoring 4 goals and 14 assists for 18 total points in 16 games, a points-per-game average of 1.125. Silfverberg could secure a spot on the second line with Kesler and Hagelin/Maroon, though it’s possible he’ll see some time on the 3rd line. Look for him to have a big role on the Ducks’ second power-play unit with Matt Beleskey and Kyle Palmieri gone. Anaheim traded for James Wisniewski at the trade deadline but used him sparingly. 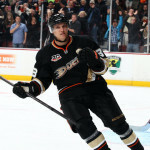 Wisniewski had five assists in 13 games for the Ducks at the end of the regular season and did not play in the playoffs. Moving him to Carolina for a backup goalie, which will allow John Gibson to develop more in the AHL, was a solid move. This may seem like an obvious point, but the Ducks have a large number of talented young players on the team that would generate considerable interest around the league. 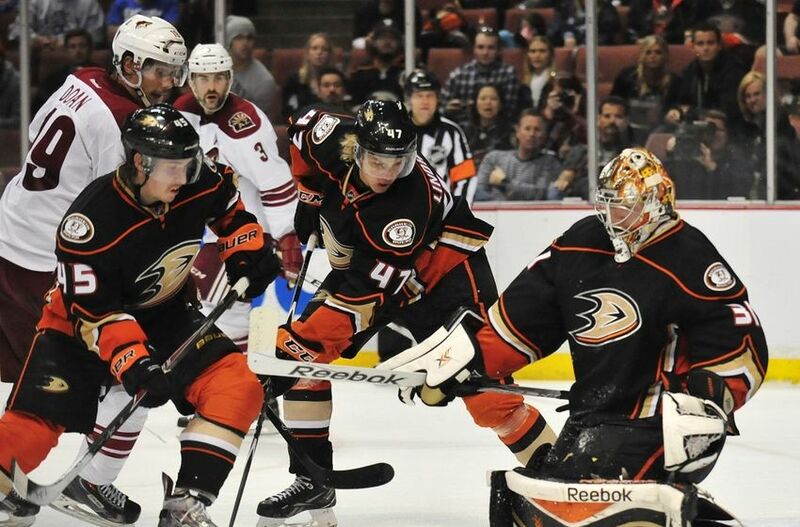 Anaheim’s young blueline is certainly the envy of most teams in the NHL, and a more desperate or impatient general manager may have moved at least one of the young defenseman, or even goaltender Frederik Andersen, if a tempting offer came along. Anaheim fans should breathe a sigh of relief that Murray has held on to most of these talented players and has allowed them to develop naturally. It is clear that this method has paid off, considering four of Anaheim’s active defensemen in the playoffs were 23 or under. Explain in the comments section! Anaheim has done a tremendous job this offseason. Even when everyone thought the Ducks were done, Bob Murray went out and signed center Mike Santorelli to a one-year contract on August 17. The Ducks have added depth, flexibility and strength down the middle without breaking the bank and without having to lose any crucial members of the team. The Ducks should not struggle much in order to clinch the Pacific division, as the division seems weaker this year than it has been in a while. Anaheim will be able to compete with all of the top Western Conference teams, like the Blackhawks, Blues, etc. Perhaps all of the offseason moves, or even just one move in particular, will end up being the difference between heartbreak and elation at the end of the season. You never know..you just never know.